Chinese New Year is a good cause for having plenty of meats and luxury dishes. We had enough for last week's CNY celebration. It’s a time to get back with more vegan dishes to balance our digestive system, even though we’re not vegan eaters. I’m glad that the meat-lover in the family didn’t complain when I served this stir fried dish, 炒三絲 (literally means stir fried three shredded ingredients – vegetables often used). You can easily find this dish from any Chinese restaurants. Different restaurants might offer different combinations of vegetables though. Some might even add a kind of meat into their own version. So, feel free to tweak the recipe here, pick any kinds of vegetables to your liking. This dish is simple, inexpensive, with high fiber and very refreshing. 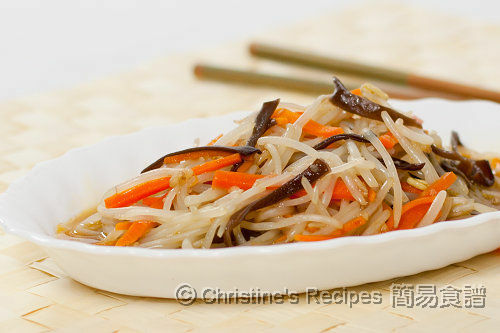 As for my version, there are some eye-catching black strips mixing with the white bean sprouts and red carrots. 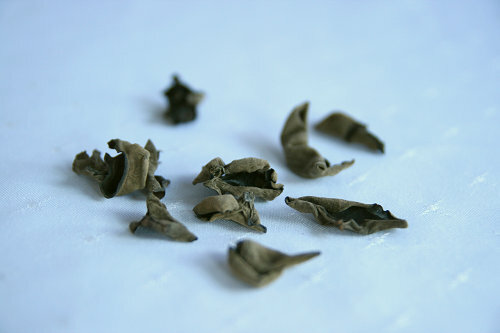 They are cut from a very special ingredient, often used in Chinese cooking, called wood ear – a kind of black fungus. Many people overlook its nutritional value because wood ear hasn’t got an attractive looking, sold at a cheap price, and in black. Actually, wood ear has more protein, iron and vitamins than white fungus. Due to their tasteless flesh, it’s seldom cooked or eaten on its own. If they are cooked with meats or stir fried with other vegetables, they’d absorb all the flavours and tastes in sauce, then become a highlight in that dish, giving you an amazingly surprise. Trim off the heads and tails of bean sprouts. (You might like to skip this step if you run out of time. The whole bean sprout is edible. Trimming is just for making the dish more good looking.) Soak the wood ears in water until softened. Rinse off and remove any dirts. Blanch in boiling water for 2 minutes. Drain well and cut into thin strips. Heat oil in a wok. Add shredded ginger and sauté until fragrant. Toss in the carrot and cook until softened. Add the bean sprouts and wood ears. Add chicken stock and continue to cook for a while. Season with salt. Pour in the seasonings. Continue to cook until the sauce dries up a bit. The vegetables should retain a bit crunchy in texture, so don’t overcook. Dish up. Serve hot. 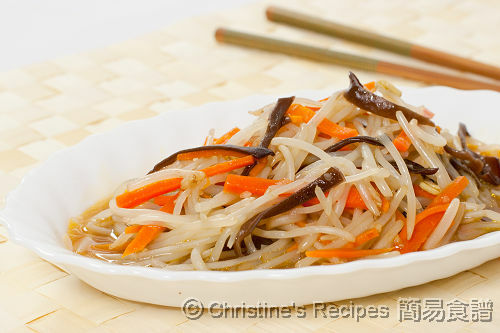 I love the crunchy texture of wood ear and your stir-fry looks very appetizing, I love beansprouts too :) A yummy combo of flavours and textures. My mom made this for CNY recently. She also added some dougan (the harder tofu). Yum! this is one of those dishes I crave for right now!! vegies! I eat wood ear fungus more often too. White fungus more in dessert cos of it's moistening effect. I like this very simple dish. And I love the texture of the wood ear fungus. A light and delicious stir-fry~! i like this dish but a bit tedious plucking the head of the bean sprouts, ha! Refreshing as u said. Something light after all the rich and sinful indulgence is good! I just made some with mushrooms instead of carrots. Yum!! Very tasty! I've got a bunch of wood ear mushrooms in my pantry and, other than hot and sour soup, I didn't know what to use them in. Thanks for sharing this recipe! I made exactly as directed and it is perfection. Amazing what you can do with three ingredients and some seasonings. Thank you Christine! Glad that you tried and liked it. It's my favourite vegan dish too. Just perfect! Another cracking recipe that was so easy! I don't think I'll pull off the bean shoot ends again.. Children & hubby didn't even notice! Thanks again Christine! Glad that you and your family liked it. No trimming, save much time. Great !